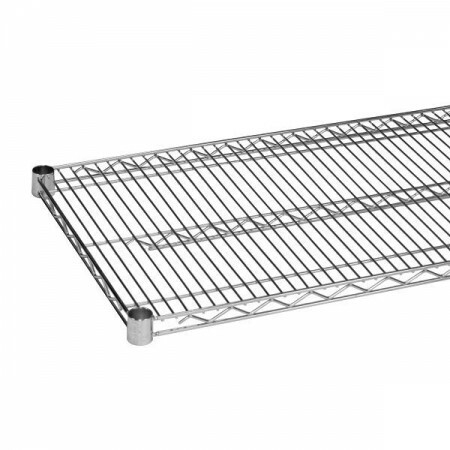 $25.99 Royal ROY S 2436 Z Polycoated Zinc Wire Shelf 24" x 36"
$53.99 Advance Tabco EG-2436 Green Epoxy Coated Wire Shelf 24" x 36"
$24.12 Winco VC-2436 Chrome Plated Wire Shelf 24" x 36"
$25.59 Winco VEX-2436 Epoxy Coated Wire Shelf 24" x 36"
A practical and economical storage option, the Thunder Group CMSV2436 Chrome Wire Shelving 24" x 36" is a great addition to any commercial kitchen. Designed with vertical ribs and an open wire design, this shelving piece allows easy access to food items. For outstanding durability, this NSF approved chrome-plated wire shelving will withstand heavy duty use, perfect for high-volume settings. Thanks to its 4-set plastic clips, this piece is easy to assemble.